If you don't see the answer to your specific question, please contact us and we will answer your question as quickly as possible. Where does my shipment come from? TracksNTeeth respects your privacy. We will not sell or use your information provided for anything other than providing a quote and following up on that quote. By providing your e-mail and phone number you authorize us to contact you via e-mail or phone to discuss your parts needs, ask additional questions if necessary, and follow-up on requested items. All of the parts we sell are backed by industry-standard warranties. Warranties range from 6 to 48 months and from 500 to 4000 usage hours based on the type of part, the application, and the supplier. We stand by what we sell and our manufacturers have great reputations in the industry. We won't work with a supplier who doesn't produce high quality parts and back them up with a warranty. It's our service to you as your main parts source to make sure you have high quality parts and that if something does go wrong, you know we will stand behind you and the parts we sell. If you'd like a copy of the manufacturer's warranty on any purchase you've made just ask and we will be happy to provide it to you as a document via e-mail, or via US mail. 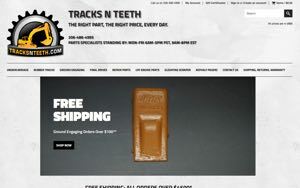 Undercarriage Parts - All Undercarriage parts sold by TracksNTeeth.com have a 3 year/4000 hour warranty. Rubber Tracks - MTL/CTL Rubber Tracks have a 15 month/1500 hour warranty and Mini-Excavator tracks have a 2 year/2000 hour warranty. Repair Parts - All other repair parts sold on our site have a minimum of 6 months or 1200 hours. Bottom line, we stand behind what we sell and so do our manufacturers. All of our parts have a standard 30-day return policy. If the part is incorrect due to manufacturer error, we provided the wrong item based on your correct machine make and model information, or if the part number is wrongly labeled we will return or exchange it for the correct item at no cost to our customers. If an item isn't needed, or the wrong item was ordered, we will return it within 30 days, providing the return shipping is paid on the item and the initial shipping cost will not be refunded. There are instances where orders or items that qualified for free shipping will be returned and that will be the responsibility of the customer to return those items. Returns outside 30 days or items purchased for applications that are not the intended application by the manufacturer may be subject to a 25% restocking fee at our discretion. We do everything we can to offer a great experience for our customers and provide quick shipping, great pricing, and quality parts. We do everything we can to keep our return policy fair to both us and our customers. We recommend speaking to one of our parts specialists before placing your order to help ensure the best experience ordering parts from TracksTNeeth.com. We ship from warehouses all over the United States and North America. We have 65 warehouses across the US where our parts are stocked. We will always give you the best options for lead times and freight times available based on your order. How do you have such a wide selection of aftermarket construction parts? We have relationships with a large base of manufacturers and suppliers for all kinds of aftermarket construction parts. This means our selection, pricing, availability, and shipping costs are the best we can offer to you. Our offices are located in Tacoma, WA just outside of Seattle. Your product will arrive from one of our warehouses with inventory nearest to you.